It all started back in 1997. 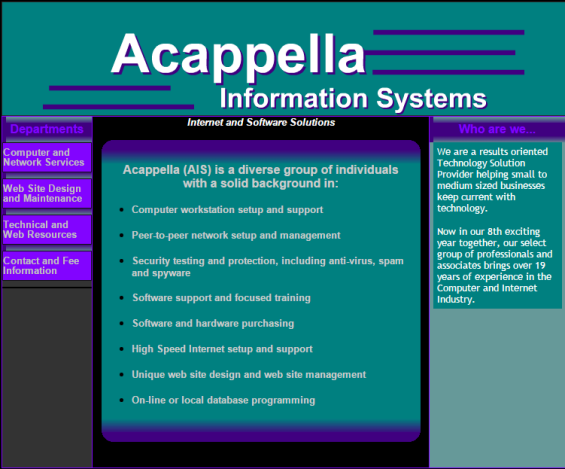 Acappella Information Systems (AIS) started with the advent of Windows 95 then 98 and a browser called Netscape. This new medium was available to anyone with a computer and AIS was already in the technology business. AIS is computer and “information” services. Information meant Internet! Look at that first logo! Designed originally in Paint Shop. By 2001 many AIS clients were jumping on the Internet. The original AIS website was manually coded using notepad back in 1999. Clients soon clamored to retain my services to get their businesses on the Internet. With help from Microsoft’s new Frontpage website editor an additional service offering took off. 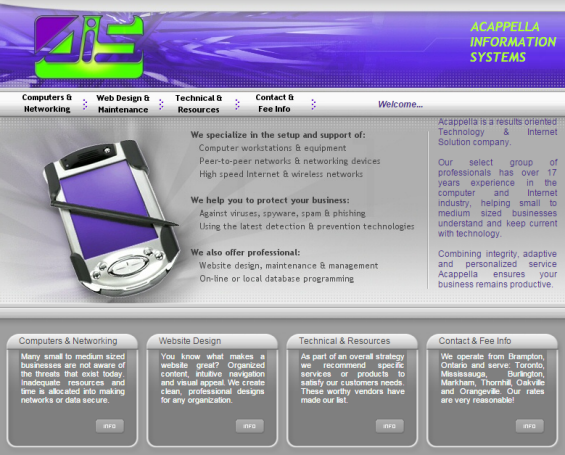 The very first AIS website! Originally coded using Windows notepad and later a “make-over” using the new Frontpage. Note the two new menu items revised to indicate the expanded web design and maintenance services. 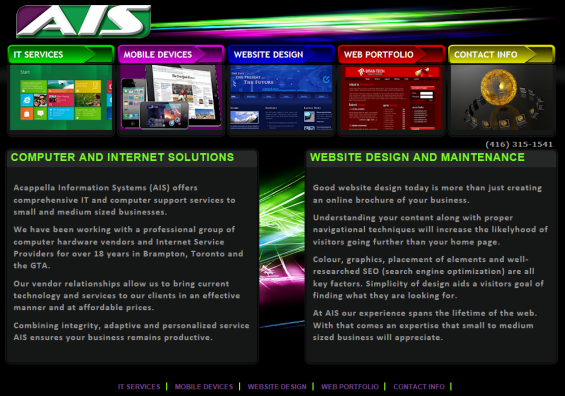 In 2005 AIS had expanded to include several new services all dedicated to the Internet. A little search engine called Google had come along and completely changed how people used the Net to find information. At the same time high speed Internet was becoming a force. With this power came advancement in web design and functionality. Sites were transformed from mostly static entities to graphically enhanced and interactive multimedia websites. All new website and logo! Note the forward thinking device shown on the home page. The iPhone was still 2 years away but handheld devices were all the rage. By 2009 competition in browser technology was fueling innovation. Commerce is pushing the boundaries in website design in order to satisfy visitors’ demands for increased functionality and interactive content. Google Chrome represents competition for Internet Explorer. Mobile is in it’s infancy with the iPhone only 2 years old and Android stepping into the smartphone space. Website design isn’t really paying attention to how it looks on mobile – yet! Note the use of images to highlight subject matter and content. Navigation is quick, straight forward and friendly to those new mobile devices! If you are looking for a professional to build your very first website, spearhead a web design make-over or manage your existing site – give me a shout.